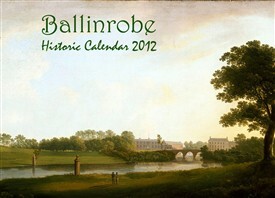 The sales of the calendar fund the hosting of the historical Ballinrobe website. All work on site is voluntary. Capture it before it disappears…. When embarking on this project we hoped to engage communities, in an exciting and innovative way, with the National Museum and its collections. This initiative has been running for three years with a new group coming on board each year. The volunteers have learned new skills through training and mentoring both by Museum staff and each other. All have worked tirelessly to seek from their communities’ family photographs, memories and other ephemera, digitising and uploading these unique collections to a website that they have developed themselves. By creating a Community Archive website this information is digitally saved for posterity and in most cases, the original images and documents are returned to their owners. Anyone can access this information and people with links to the locality are encouraged to take an active part by contributing their own information. The groups have joined together to form a Network of sites so they can share knowledge, skills and resources and cross-promote their websites. The work of the volunteers has made this project a success. The Museum would like to thank everyone involved, especially David Collins, Averil Staunton and Mark Reed who have travelled regularly to the Museum and have acted as liaisons for their groups. We would encourage more people to get involved in this very worthwhile, interesting and exciting project. 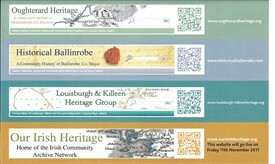 Ballinrobe http://www.historicalballinrobe.com/ continues to blaze a trail with the use of new media technology such as historical maps and trails downloadable via free apps. to your smart phone. The Louisburg-Killeen website went live only recently and will continue to expand their archive. All the groups will be engaging with their local schools in the coming year and hope to bring on board new volunteers. The Oughterard Culture and Heritage Group was formed four years ago to collect, archive and share our local history. With the backing of the local community we are now one of the leading groups in the country that are digitally sharing our heritage. A small group of people with an interest in the history of Ballinrobe, its neighbouring towns and townlands, founded the Ballinrobe Archaeological & Historical Society in 2009. “We aim to try and salvage the flood of information that is being lost every day, week or year by creating a digital archive for the community, our friends, visitors, Diaspora, researchers and future generations”. Louisburgh-Killeen Heritage Group http://www.louisburgh-killeenheritage.org/ are a small group of volunteers who came together in 2011 to record and preserve the history and heritage of the area. In partnership with the National Museum of Ireland-Country Life we maintain an open access website and encourage contributions from all. Most of the information has been contributed by ordinary folk who have an interest, be it past or present, in the community and its people. As part of the project the Education & Outreach Department are launching a website http://ouririshheritage.org/ on the 11th November, 2011. This website will feature articles from across the sites and will provide information and advice on creating a Community Archive. Anyone with an interest in their local heritage has an opportunity to contribute to this website which we hope will eventually reflect the local history of the island of Ireland. Groups and organisations that would like to promote cultural and heritage events on this website should contact the Education & Outreach Department. This page was added by Averil Staunton on 08/11/2011.